Laurentian University is committed to fostering a strong culture of sustainability. In 2009, our President and Vice-Cancellor signed the Council of Ontario Universities pledge, Ontario Universities: Committed to a Greener World. By signing this pledge Laurentian University accepted responsibility to: "to assist in ﬁnding solutions to the challenges of environmental sustainability; to share knowledge about sustainability and climate change; and to incorporate, wherever possible, principles of sustainability into our own operations". Sustainable initiatives at Laurentian University are driven and achieved by faculty, student and staff engagement and collaboration. Our mission is to promote environmental stewardship for the campus community in the hopes of continuously building a sustainable future to learn, work, live and play. June 30, 2016 - Answer the call of the wild! 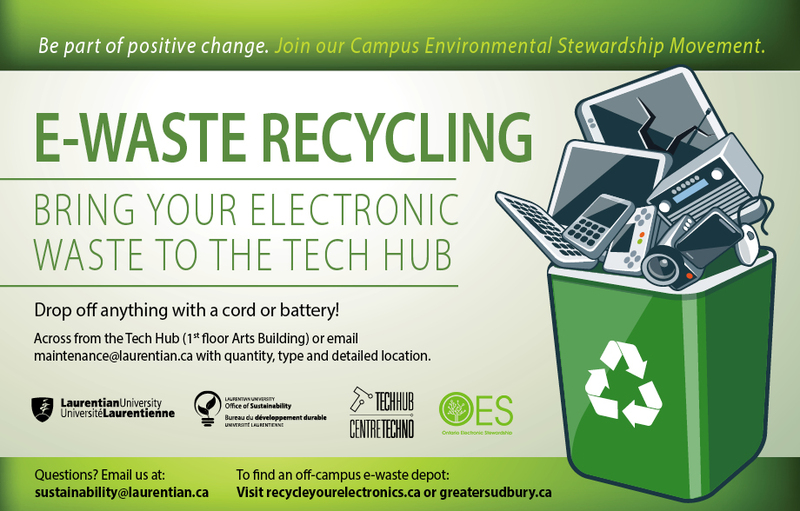 In partnership with the Toronto Zoo, the Laurentian University Office of Sustainability has now established the Phone Apes program on campus! This program allows students, faculty and staff to recycle their cell phones to help protect gorillas and their habitats. Recycling cell phones will help reduce the demand for coltan, a mineral used to make cell phones. Coltan is mined in central Africa and is affecting the habitats of gorillas and other species. Phones can be dropped off at the J.N. Desmarais Library or the TechHub. Laurentian University has joined the growing number of signatories to the Paris Pledge for Action, released December 16, 2015. The pledge is a commitment to work to reduce greenhouse gas emissions immediately, to meet or surpass the goals of the Paris Agreement adopted at the recent COP21 conference. Laurentian University is among the first Canadian universities to sign the pledge. According to the Paris Pledge for Action organization (www.parispledgeforaction.org), the pledge represents “a unique opportunity for non-state actors to have their climate leadership recognized in the context of COP21.” Signatories “welcome the adoption of a new, universal climate agreement at COP21 in Paris, which is a critical step on the path to solving climate change. We pledge our support to ensuring that the level of ambition set by the agreement is met or exceeded. We will do this by taking concrete steps now, and without waiting for the entry into force of the agreement in 2020, both individually and cooperatively, to reduce greenhouse gas emissions to a safe level and build resilience against those changes already occurring.” Laurentian University joins more than 1,000 cities, municipal and regional councils, companies, investors, civil society groups, labour organizations and other signatories from around the world to promote a low-carbon, stable, sustainable future, with the goal of limiting the global temperature rise to less than two degrees Celsius. In 2014 Laurentian University signed the Talloires Declaration, a ten-point action plan for incorporating sustainability and environmental literacy in teaching, research, operations and outreach along with over 400 colleges and universities in more than 40 countries. Ontario universities are improving efficiency by finding new ways of doing business and forming innovative partnerships. Universities continue to cut costs through collaboration, shared services, and administrative efficiencies, while improving services for students and staff. The Ontario government’s Productivity and Innovation Fund (PIF) – a $45 million investment in Ontario’s postsecondary sector – was a major catalyst for collaboration that has achieved amazing results. The report features several PIF projects and also highlights what individual universities are doing to leverage technology, modernize administrative processes and make their facilities and operations run smarter, not harder. See the attached Council of Ontario Universities 2015 with special mentions of Laurentian University! Ontario universities’ sixth annual Going Greener report highlights progress made by campus communities toward environmental sustainability. Based on a survey of Ontario universities, this report features initiatives from 2013-14 and progress made since 2009. These important improvements include increasing local and sustainable food options at campus vendors, encouraging use of public transit, and building high-standard, energy-efficient infrastructure. JULY 3, 2014 – Laurentian University’s new School of the Environment, approved by the University Senate earlier this year, is now open, with 13 faculty forming its core and 13 more faculty soon to be cross-appointed from other departments. The School currently houses five existing programs: Environmental Studies, Environmental Science, Études de l’environnement, Science Communication, and Archaeology. It will contribute to environmental programming offered by other departments across campus, and will collaborate with the Vale Living with Lakes Centre and other research centres, including the Centre for Evolutionary Ecology and Ethical Conservation (CEEEC). The School will help to consolidate and strengthen the University’s expertise and reputation in all studies related to the environment, said the School’s inaugural Director, Dr. Brett Buchanan. “As a society, we are faced with momentous and far-reaching environmental issues. It is appropriate that Laurentian have a School to foster and lead critical awareness in environmental research and action,” said Laurentian University President and Vice-Chancellor Dominic Giroux. May 23rd, 2014 - The Newest AASHE Member: Laurentian University! Laurentian University is thrilled to be a new member of the Association for the Advancement of Sustainability in Higher Education (AASHE). Laurentian University, along with over 800 other higher education institutions across North America, connect to share best practices and benchmark their sustainability progress. Like other higher education institutions, Laurentian recognizes its responsibility to promote environmental stewardship to the next generation entering the labour market. AASHE is an excellent resource to assist in succeeding at this endeavour through the University’s core practices of teaching, research and operations. I would like to take the opportunity to introduce our new Manager of Energy and Sustainability, Kati McCartney who will be joining the Physical Plant and Planning team. Kati is an alumnus of Laurentian University graduating with a Masters in Science, Chemical Sciences and a Masters in Business Administration. In her new position at Laurentian University Kati will lead the development of sustainable operation planning, managing the energy purchase/use portfolio and exercising a leadership role in coordinating the endeavours of the President's Action Committee on the Environment (PACE) amongst other duties. Kati comes to us from a local mining company where she most recently held the position of Section Leader, External Materials Management and Quality Assurance Coordination of their in-house labs. She also held the position of Senior Environmental Analyst and has had experience as a Professor at Cambrian College. Kati will be starting with us on Monday, May 5th and can be reached at ka_mccartney@laurentian.ca, or ext. 1538. Her office will be in the Maintenance and Security Building. Please join me in welcoming Kati to Laurentian University. Do you have used Textbooks? The SGA is proud to serve the Laurentian University community for a second year with its LUL SafeWalk service. LUL SafeWalk is a student volunteer operated program that offers all Laurentian students, staff, faculty and visitors a male and female walking team who will ensure you arrive at your campus destination safely. SafeWalk serves all on-campus buildings (including Willet Green Miller and The Vale Living with the Lakes Centre) as well as all parking-lots, bus stops and residence buildings. If you see the teams of blue vest-clad SafeWalk volunteer walkers out and about on campus, feel free to stop them to request a walk. Thank you on behalf of The Laurentian University Office of Sustainability and School of the Environment for participating in the 2016 Commuter Challenge! Share your great ideas, find volunteer opportunities, request support or promote an event.